As a mama, I can tell you that the only thing that is worse then a baby with a cold is a baby who is cutting teeth. My two children were ALWAYS fussy when they were teething and I can't even begin to tell you all the long nights I have had rocking and soothing them. Recently, my 22 month old has not been sleeping well at all. He wakes up screaming and crying and won't go back to sleep unless I go and rock him. Just the other night he was up about 4 different times and when he wakes up, he usually is good at waking up his sister too. This makes for a very long night for me. I checked his mouth yesterday and sure enough, he is cutting four teeth. Fun. So, last night as a precaution, I gave him a small dose of Ibuprofen and he slept all night...for the first time in a long time. What a blessed experience that was for ME! I haven't slept that well in quite some time. Well, as you are all probably aware, I am expecting our third baby and am due to have this little one in just 2 short weeks. I will once again be going through the "cutting teeth stage" at some point in the coming year and this time, I am going to be prepared! Tommee Tippee is a company that I have worked with in the past and I am thrilled to be able to share them with you all again during this event! They have more then just oral care products for infants, they also have some fabulous cleaning supplies (which I did not know). So, today I will introduce you to these products and tell you a bit more about this company. Loved by parents and children alike, Tommee Tippee has received numerous brand accolades in Great Britain, including top ranks in the prestigious Mother and Baby Awards, a head-to-head assessment of competitive products voted on by moms themselves. The Tommee Tippee Closer to Nature line of baby bottles has been chosen as Great Britain’s best baby bottle, winning the Gold award in 2006/7, in 2008/9 and again in 2009/10. In 2009, Tommee Tippee was the first and only children’s feeding brand to be selected as a UK Superbrand in a nationwide poll of consumers, putting it on par with brands such as Microsoft®, Coca-Cola®, Nike®, Lego® and Google®. Just the fact that they are so popular and known world-wide speaks volumes. I have been impressed with their products in the past and they are coming up with so many more wonderful solutions for parents! I will start off by telling you a little bit about the Chewthers. I honestly didn't know what a Chewther was until I looked them up and I am VERY excited about these. Based on your baby's age, each Chewther is designed to prepare them for eating various types of foods. They start at Stage 1 (3 months of age), which is meant to help prepare your baby for thicker liquids and go right through to Stage 4 (9 months), which helps prepare infants for chunky foods. Chewthers also allow baby to teethe to their heart's content without hindering their speech development. 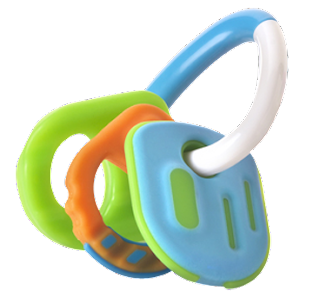 If there is one thing I hate about pacifiers, this is it. If not taken away by a certain age, I think it can hinder the child from speaking clearly. The jaw and muscle coordination of babies is also well supported when using a Chewther as well, which is really important. So, I am now fully prepared for another teething baby! Now, I will introduce you to Tommee Tippee's fantastic line of cleaning products! All of their cleaning products are free from alcohol, chlorine, fragrances and dyes, making them well qualified to be safe and effective for use around babies. First, I tried the Antibacterial Hand Gel. This is like a hand sanitizer that you can stuff in your diaper bag, or keep close to you while strolling at the park, zoo or just sitting around at home. It is not sticky at all and leaves no yucky residue. If you are preparing to feed baby, just squirt a small amount on your hand, rub it in and you are all set! The next cleaning product I tried was the Baby Gear & Feeding Surface Cleaner. 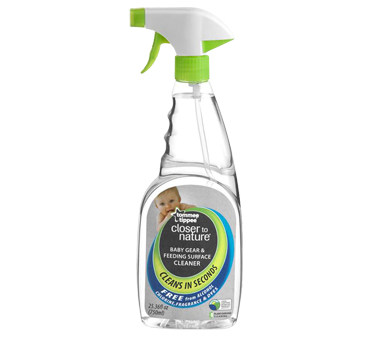 This is really a perfect cleaner for me as my little guy is still in a high chair (my preference, not his...for sanity's sake!!!). His high chair can get really grimy from those sticky little hands and I like to be able to clean it easily and quickly. Well, this spray cleaner is just the thing that I need. All you need to do is spray the surface that you want to clean and then just wipe down. You don't have to worry about rinsing it off either, it is perfectly safe. This can also be used for any surface that baby comes in contact with, not just high chairs and feeding surfaces. Last but not least, I gave the Bottle & Feeding Utensil Wash a try. Because I am not in a bottle stage right now, I used this to wash some baby dishes that I have. The children like to play with some of the plastic bowls that I have so this was a great opportunity to try out this product. It gets nice and sudsy and is gentle on my hands as well. I have really dry hands so having something that isn't harsh is great! I was really happy with how this soap worked for me. It didn't take much at all to wash and clean my dishes. Fantastic! Each of these above-mentioned products can be found at Babies 'R' Us and also online. Prices vary on sizes and styles. So, in my opinion...Tommee Tippee has once again impressed me! I am totally in love with the Chewthers and really wish I had them for when my children were going through that hard stage in their lives. I also love the cleaning products and am really excited to be able to have them on hand for our up-coming baby. I would definitely recommend these products to any busy mom out there who is looking for solutions on how to better care for her children! Disclaimer: I received no monetary compensation for this post.I did receive free Tommee Tippee products for review purposes. All quotes and stock photos are from the Tommee Tippee website and email. Prize is being provided and shipped by the sponsor. All thoughts and opinions are 100% mine. My daughter loves the bottles and I'd love to also try the L'il sippy cups. Would love to try their cleaning products! I would love to get the Closer to nature Digital Video Sensor Pad Monitor! I would also like to try their closer to nature Digital Video Sensor Pad Monitor. I would love to get my breast feeding daughter the Closer To Nature bottles. I like the Tommee Tippee Explora Sippee Sip Cup. I would love to try the truly spill proof sippy cup pink/green! the loser to nature Digital Video Sensor Pad Monitor. explora ® truly spill proof trainer cup x 1 - blue. I would like to try their Closer To Nature microwave steam sterilizer.